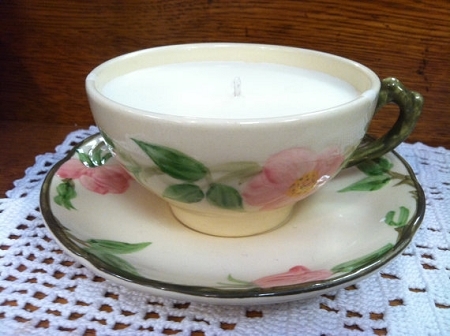 Franciscan Desert Rose teacups make beautiful candles! Why buy a standard jar candle, when you can have one of our unique creations! We paired this with our Rosewood & Musk - an absolutely beautiful earthy scent. One of our biggest sellers. When you're done with your candle, clean out the cup/saucer and add it to your collection or use the teacup for its originally intended purpose!